Old TPMS Tools: Can I Still Use This in the Shop? Old TPMS Tools: Boat Anchors or Trade Bait? Technology is always changing, and in nearly all cases, improving. Sometimes that means we become pack rats and accumulate “old technology.” How many of us still have a “tube” television or VCR in the basement? Or even more likely, a junk drawer full of flip phones, Blackberries and Palm Pilots? What can we do with all of these outdated devices? Can they be repurposed, or how do we properly dispose of them? That answer is sometimes complicated and it depends on the device. So, how does this relate to TPMS? I will explain, but first a brief history lesson…. 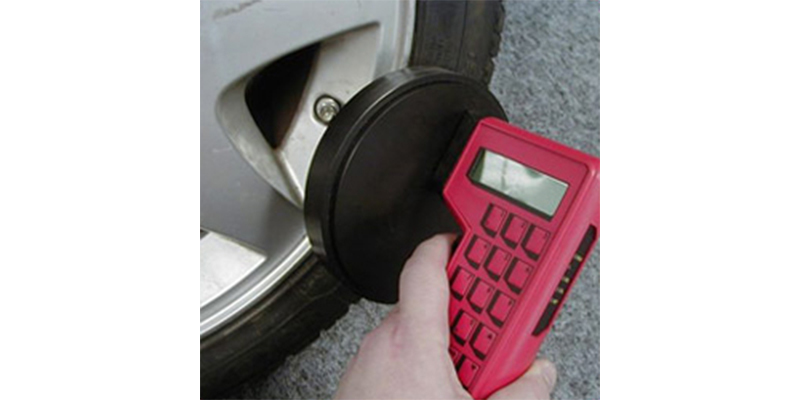 TPMS service tools have been available since 2000. In the beginning, these tools were primarily used in automotive and wheel assembly plants. In the early days, the volume of vehicles with TPMS was low and many wheel and tire assemblers used hand tools to test the sensors after assembly. On the vehicle assembly side, these same tools would be used to program the vehicles. It was a bit later that automated TPMS equipment would become part of the automotive assembly line. Soon after the OE plants adopted equipment to accommodate TPMS, service tools were made for OE dealers, and later, the aftermarket. To help understand the tool types, I’ve classified the range of tools by generation. Currently, there are four generations of tools. Early TPMS tools were very basic in operation with interfaces with LED lights and buzzers. When there were only a couple of different sensor protocols and limited ways to relearn a vehicle, these tools were more than adequate for service. However, by 2009, sensor technology (and relearn requirements) had evolved, and it was soon very obvious that TPMS tools had to offer more features in order to properly diagnose and service vehicles equipped with TPMS. At a minimum, TPMS tools needed a display to facilitate proper tool set up and for technicians to see the data being transmitted from the TPMS sensors. TPMS tools that included an OBDII connection were quickly becoming the norm, as most imported vehicles required that the sensor ID relearn process to be done through the OBDII port. Today’s TPMS tools need to be able to do much more through the OBDII connection, such as VIN scanning, DTC detection and decoding, reading out of the TPMS ID’s, TPMS relearns and recommended inflation pressure (placard) adjusting. Each of these are key in the successful diagnosis and service of a vehicle with TPMS. The market today is demanding tools that help service providers deliver better customer service and improve their bottom line. The desire for Wi-Fi updating, wireless connectivity, printed inspection reports and data management are driving the next wave of TPMS tool technology. 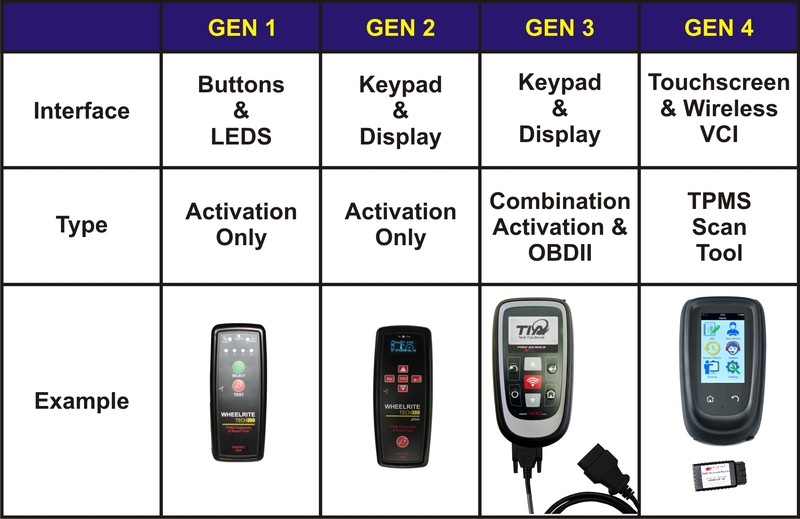 So as we enter into the fourth generation TPMS tool, what about those older TPMS tools that you invested in? The first generation tools have very limited use and value. Most if not all of them are no longer supported with software updates, and because they have LED interfaces, they will in most cases lead to technician confusion. At this stage, it’s common for these tools to not work with the large array of aftermarket sensor technology. Bear in mind, when Gen 1 tools were first introduced, there were only OE, direct fit sensor replacements. Today, there many types of aftermarket sensors and activation protocols. The Gen 1 tools are not very capable when it comes to dealing with all of today’s aftermarket sensors. Gen 3 tools are currently the largest population of tools and most common in use today. That said, there are many iterations and versions, and the older Gen 3 tools are not as capable as the later ones. Their usefulness will depend on whether they’re still under support from the manufacturer. Because these tools can perform more complicated services that rely on up-to-date coverage, it may prove difficult to work on later model vehicles. It is critical to keep Gen 3 tools up to date so that they can detect sensor programming changes, relearn changes and placard changes. Five years seems to be a very common service life for technology related tools. Anything past that time, and you run the risk of not having current software support. Gen 3 tools that are newer (less than five years old) still have a place in the workshop. This is becoming truer as the number of vehicles with TPMS on the road continues to climb. More vehicles equipped with TPMS generates a greater need for multiple TPMS tools in the tire shop. The newer Gen 4 tool fits this purpose. Recommendation: More than 5 years old, limited use/trade in. Less than 5 years old, continue to use. Of course, much of this can be subjective, and in the end, one must consider the investment you’ve made in current tools before deciding what to do with them. If you’re still using the older technology tools like a Gen 1 or Gen 2 tool, it is definitely time to make the jump to newer TPMS tools. Their features and benefits, as well as their speed, are certainly worth the investment. If you have a newer Gen 3 tool, keep using it and think about how many TPMS tools are right for your operation. If you have an older Gen 3, you may consider trading it in for a new tool, since the trade in value now likely exceeds the useful value.